Gold ENnie award winning website. What is Blades in the Dark? 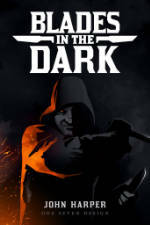 Blades in the Dark is a tabletop role-playing game about a crew of daring scoundrels seeking their fortunes on the haunted streets of an industrial-fantasy city. There are heists, chases, occult mysteries, dangerous bargains, bloody skirmishes, and, above all, riches to be had — if you’re bold enough to seize them. You and your fledgling crew must thrive amidst the threats of rival gangs, powerful noble families, vengeful ghosts, the Bluecoats of the city watch, and the siren song of your scoundrel’s own vices. Will you rise to power in the criminal underworld? What are you willing to do to get to the top? You can purchase the Blades in the Dark rulebook as a digital PDF or in a Hardcover + PDF bundle from Evil Hat. This site is a friendly, searchable, bookmarkable home for Blades in the Dark. Here you'll find links to the CC-licensed System Reference Document (which you can use to create your own games using the Blades system), player and GM resources, supplements for the game, and a lot more. Just use the links at left to prowl around.